PRIVACY! PRIVACY! PRIVACY! Atop Bluff Mountain, surrounded by woods and breathtaking, panoramic views of countless mountain ranges, awaits Smoky Mountain Visions. The alluring peaks and ridges, the song birds, the spring flowers, the starry nights, the fall foliage, the traditional wood burning fireplace, the charming loft, the hot tub, and the seclusion of the cabin will revitalize you and your loved ones. Children have room to explore the gentle terrain, not only the one acre grass and wooded property, but also the quiet, secluded country drive. A lower deck and a children’s clubhouse have recently been added to offer both easier access to these areas as well as further entertainment options. Smoky Mountain Visions sleeps four and, in addition to the above, is equipped with 2 TVs, DVDs, VHSs, family board games, washer and dryer, full kitchen, and picnic table. We went away to the mountains to elope, and chose this cabin to stay in. No regrets whatsoever! The view was spectacular! It was so quiet and peaceful. We didn't get a chance to utilize the beautiful trail due to rain, but we thought it was a very thoughtful touch. We have stayed at a lot of cabins over the years. This one has been a favorite by far. I loved all of the books, DVDs, games, and rainy day activities. We cannot wait to bring our two children with us one time so that they can use the cool little loft and treehouse on the lower deck. Again, this cabin has so many thoughtful details through out, even down to the gorgeous landscaping. We also cant wait to come back again every year for our anniversary. Thanks for providing an exceptional cabin to make important memories in. Highly, highly recommend!! Loved it. See for miles! Such a great place. Couldn’t have been more pleased. All the conveniences and charm we could want. Spectacular views. The view was amazing, however the bed was horrible it really needs to be updated, whoever is looking after the cleaning needs to be addressed, there was dust on everything and it was a lot of dust! I’m pretty sure somone is being paid to clean it but clearly they are not! I had a hard sleeping due to the mattress, you could feel the springs!! We loved our stay at this cabin! The location was great as it was near the National Park so we could enjoy hiking, but was also near Pigeon Forge and Gatlinburg for shopping and restaurants. 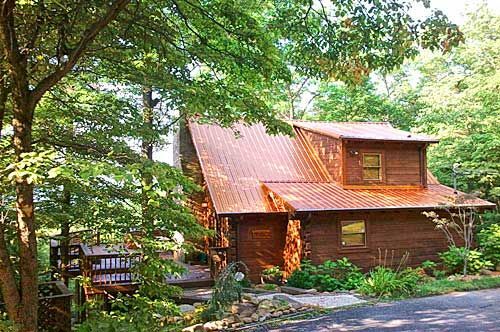 The cabin has a beautiful overlook of the mountains and wonderful privacy to get away from everything. Would definitely stay here again. Beautiful cabin with an even better view!! My husband wanted a secluded, rustic cabin for his birthday trip and that is what he got! The views are phenomenal, especially at sunset. You definitely have privacy and the ability to relax. The only problem I had was with the curvy mountain road leading up to the cabin, but it was worth it to have the view!